Many people experience minor toothaches at certain points in their lives. While not all aches are serious and problematic, still it is better to seek professional dental help when necessary. What many don’t realize is that the cause of a toothache is not limited to dental problems. There are non-dental causes which may be serious when not diagnosed and treated. Inflamed Tooth. This happens when the cavity has caused decay which already affects the pulp inside the gum. Due to the presence of bacteria and decay, the pulp and gums get inflamed and infected. This affects the nerve endings of the teeth, hence, the pain. When the tooth is already badly damaged and is beyond saving, your best option may be tooth extraction. Abscessed Tooth. This is an infectious material affecting the root of the tooth. This is already caused by cavities. This happens when the decay has spread to the pulp and the root of the tooth. When the body reacts, the result is an abscess, which is very painful. The best way to treat this is not extraction, but to drain the abscess through a root canal procedure. Cracked tooth. A cracked tooth in itself is not painful. However, when it affects the pulp of the tooth, that is where the problem starts. It can cause inflammation and pain. Luckily, there are various dental procedures available to fix this, depending on the extent of the damage. Your options include root canal, crown tooth, and stabilization. Periodontitis. This is a type of gum disease which is more known as gingivitis. This happens when the gums and the roots of the tooth are inflamed. This is caused by poor oral hygiene and bacteria buildup. Ear Infection. To answer the question if ear infection can cause a toothache, yes, it does. People with undiagnosed ear infection often experience pain in the jaw and teeth. This is because of the proximity of the ears to the said areas. If you experience ear ache, jaw pain and toothache, chances are you have an ear infection. The best way to find out is to go to a specialist. The good news is that such infection can be easily treated and usually goes away in two weeks time. Sinusitis. This is another possible cause of a toothache. The reason why the pain radiates to the jaw and teeth area is because of their proximity to the sinuses. Tooth pain can occur due to the pressure caused by sinus build up. If the cause is sinus infection, go to a specialist for proper treatment. In rare cases, this condition can manifest as a tooth pain. It is a disease that affects the facial nerves known as the trigeminal nerve. When this nerve malfunctions or functions hyper-actively, the person may experience enhanced pain in the facial areas, including the jaws. It is best to have your condition treated immediately by a proper medical professional. Heart Attack. Although this least happens, toothache could be a sign of a heart attack. In certain cases, people who are suffering from heart attack experience referred pain in the teeth and jaw. If you have cardiovascular problems or heart issues, then you must watch out for such signs and symptoms. When you experience a recurring toothache and other symptoms, it is best to go see a dental professional. This is not only important for the treatment but also to prevent further damage. 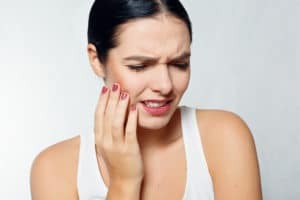 While a toothache may not be that harmless, when left untreated, it may lead to more complicated dental and non-dental issues. Do not wait for your toothache to progress and become worse. Immediately see a dental professional you can trust. Schedule an appointment with East Valley Dental Professionals. We help our patients not only by taking care of their teeth and gums and treating their dental problems; but also by teaching them proper oral hygiene techniques and strategies. Our concern is for you to keep your mouth healthy and fresh.